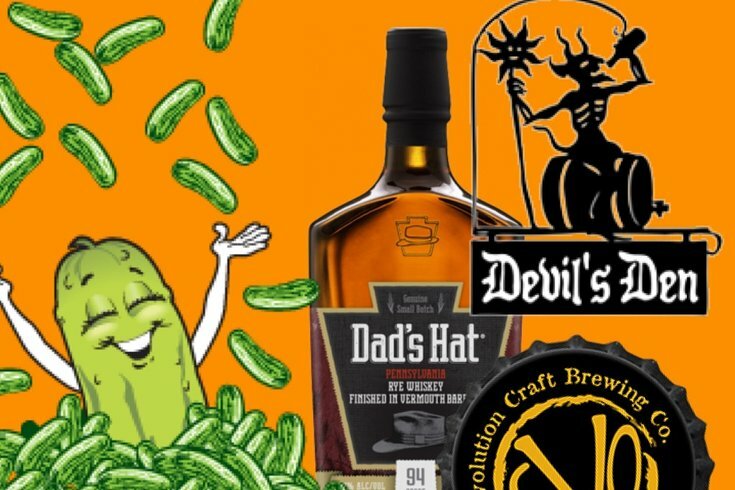 Devil's Den and Evolution Craft Brewing have partnered to create 'What The Dill,' a pickleback beer. For the average drinker who doesn't completely despise pickles, pickleback shots are nice because the pickle flavor does a good job of masking the alcohol, while the pickle taste usually isn't too overwhelming. But could the same be said for an entire beer with pickle flavor? South Philly bar Devil's Den and Evolution Craft Brewing intend to find out. They have collaborated on a pickleback beer after people with Evolution visited Devil's Den and tried the pickle-infused whiskey made by manager Kris Hagan. Evolution, which was originally based in Delaware before moving to Maryland in 2012, is able to produce small, one-off batches of beer. With Hagan's help, their next select brew will be called "What the Dill." The beer will be released at Devil’s Den at 7 p.m. on Thursday, April 26. There will be pickle-inspired food and drink specials at the debut, such as a "bloody pickle" (a pickle-infused Bloody Mary), pickleback chicken wings and fried pickle chips. "I've never set foot in Devil's Den before, and now I'm happy that I haven't."